Chris Seitz, a goalkeeper for FC Dallas, registered to become a bone marrow donor in 2008. At the time he was playing for Real Salt Lake and their midfielder Andy Williams’ wife, Marcia, was battling a rare form of cancer. In a show of support Chris, his then teammates, and hundreds of others in the MLS community all got swabbed and entered into the registry. Four years later, Chris learned that he was a potential match for a dying patient in need of a bone marrow transplant. Coincidentally, this news came a little more than a week before Chris’ Uncle John, who was diagnosed with leukemia, was scheduled to receive a bone marrow transplant. Chris’ father served as the donor through a process called apheresis, a relatively simple procedure that is similar to a blood transfusion. Just as both Marcia and Unlce John’s lives were saved through transplant, Chris now had the opportunity to make that possible that for someone else. However, because of the type of cancer the potential recipient had, the less invasive procedure Chris’ father underwent was not an option. Chris would need to undergo a surgical procedure that would allow the bone marrow to be extracted directly through the bone. Typically, the donor recovers from this type of procedure in a few days, but being a professional athlete made the situation a little more complicated for Chris. As a goalie, he regularly needs to dive on those same bones that the marrow is extracted from, putting the rest of his soccer season and recovery in jeopardy. Despite the many obstacles, Chris knew that this was something he had to do, and after much planning and consideration, he flew to the East Coast to become a bone marrow donor. Click here to read the full story about Chris Seitz’s bone marrow donation and watch his video diary documenting the experience. Dr. E. Donnall Thomas, picture left, died over the weekend, at the age of 92. Called “the father of bone marrow transplantation,” Thomas led the way in developing transplantation as a viable treatment for blood disorders and cancers. In the late 1960s, his team performed the first transplant using a matched sibling as the donor. Their successful transplant in the 1970s using an unrelated donor led to the establishment of the national registry. In 1990, Thomas was awarded the Nobel Prize in Physiology or Medicine in recognition of his work. Click here to read Fred Hutchinson Cancer Research Center’s tribute. Click here to read the New York Times article about Dr. Thomas. Now that the 2012 Summer Olympics have closed, the focus turns to the 2014 Winter Games – especially for Seun Adebiyi. 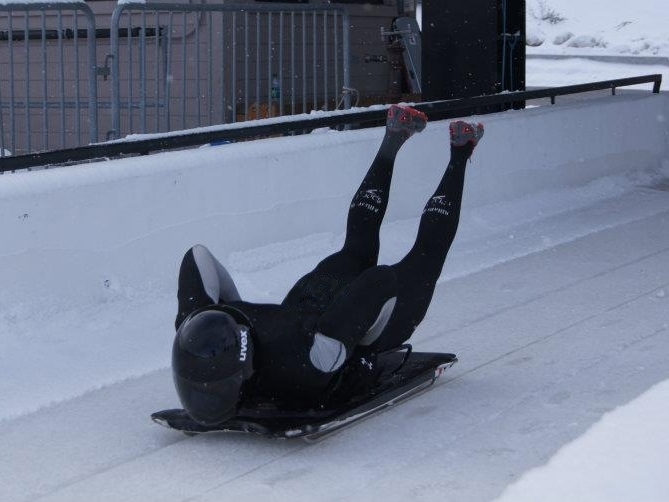 The 29-year-old is training to compete in skeleton, a sport involving racing on a small sled down a frozen track, on behalf of his native country Nigeria. An impressive feat in its own right, Suen’s story includes a few hurdles that have altered his plans and given him additional goals. Seun has had dreams of the Olympics since he was a child. As a part of the Nigerian Swim Team, he missed the 2004 Olympics by one-tenth of one second. A few years later, while a law student at Yale, Seun discovered the sport of skeleton and a new Olympic dream was born: to become Nigeria’s first competitor in the Winter Olympics. He started training for the 2010 Games. In 2009, just after graduating from Yale Law School, Seun learned he had two rare and aggressive blood cancers: lymphoblastic lymphoma and stem cell leukemia. His doctors told him that he needed a stem cell transplant in order to survive, but unfortunately, a matching donor could not be found in the national registry. The most viable matches are generally found within a patient’s own ethnic group, so Seun’s Nigerian heritage and the shortage of African American’s in the national registry combined to work against him. Putting his skeleton training on hold, Seun became an advocate for cancer patients of African descent, raising awareness of the need for more bone marrow donors. He worked with the South African registry to organize a donor drive in Nigeria. Shortly before he was to leave for Africa, Seun learned that a match for him using cord blood had been identified in the United States. Although Seun was no longer searching match, he put his own health at risk by proceeding with the trip in order to raise awareness and register potential donors for other patients in need. For more information about becoming a bone marrow donor, click here. November 2010 ESPN profile – “E:60 Skeleton Man” or watch it below.